3T - 4T - $19.99 Only 6 left! Vest style shirt w/ attached white "undershirt" and bow tie, printed w/ "Born to Golf"
Four! Is he going to be the next champion of the golf green? Then it's time we start out his professional career right. 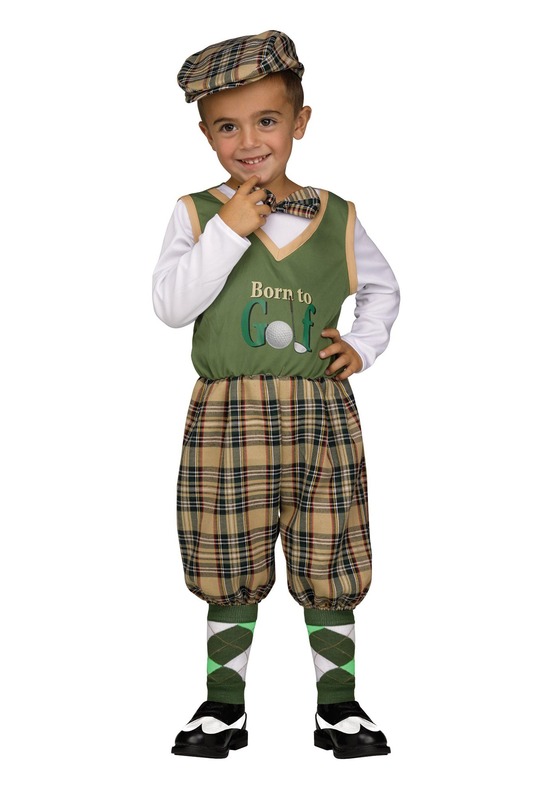 And for us, the only way to get your tot ready to tee off will be by outfitting him with this Lil' Golfer Costume for toddlers! With the classic styling cues of a vintage golfer, he'll be ready to grab a 9 Iron and head to the range! So, he might be a little on the small side to have his own set of clubs, but that's no reason not to start him off in the world of golf by dressing him in this adorable costume. Styled as a one piece jumpsuit with coordinating cap and socks, he'll be ready to hop in the golf cart with this sweet look. Knicker style pants have a classic plaid pattern and they hit at the knee with an elastic fit. The upper part of the jumpsuit is styled as a faux vest and long sleeve shirt with a "Born to Golf" graphic print on the front. Matching plaid bowtie is secured to the jumpsuit, and a matching driving cap and green and white argyle socks complete the look. When you outfit your little one with this adorable look, the only thing you'll have to start worrying about is how to figure out his handicap!